This cabinet card portrait features an eight year-old boy named Augustus Davies. An inscription on the reverse of the photograph provides his name and age. 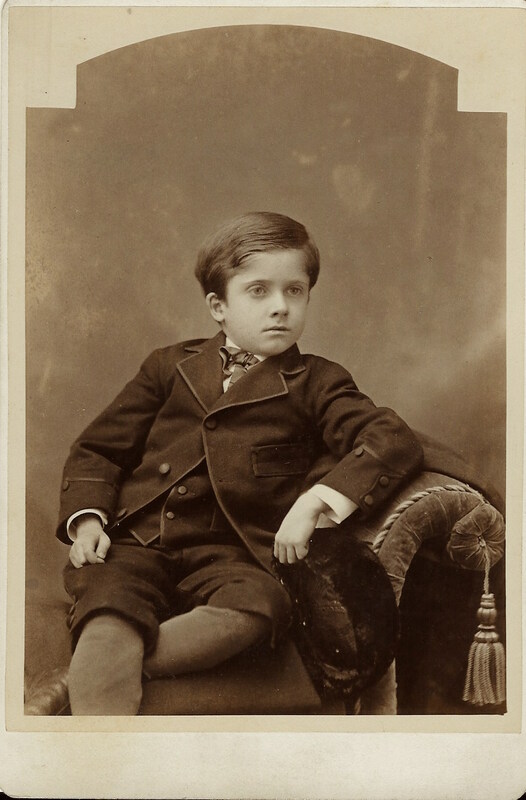 The young boy is well dressed and well groomed and exudes an air of confidence. The photograph comes from the studio of G. W. Pach in Poughkeepsie, New York. At the time of this photograph, Pach also had studios in New York City, West Point, and in Long Branch (New Jersey) and Ocean Grove (New Jersey). Pach is a celebrated name in Cabinet Card era photography. Pach Brothers was a famous New York City photographic studio located on Broadway and many celebrities had their photographs made at that location. The founder of the studio was Gustavus Pach who died in 1904. His two brothers, who were his partners, were Oscar (predeceased Gustavus) and Gotthelf. The studio was so successful that it opened branches in Massachusetts, Connecticut, New Jersey and Pennsylvania. To view other photographs by G. W. Pach and Pach Brothers studios, click on the category “Photographer: Pach Brothers”. The child in this portrait grew up to become an established painter and craftsman. He was born in Poughkeepsie in 1867 and died in 1951 in Almeda, California. The 1900 US census found Augustus living in Poughkeepsie with his 72 year-old mother, Fran Davies and two servants. His occupation was listed as “painter”. The 1910 US census revealed that Augustus still lived in Poughkeepsie with his mother but that he had added a 35 year-old wife (May Elton Morrow) and a two year-old son (Elton Davies). He had jettisoned the two servants and had hired a cook. This time his occupation was listed as “artist”. Davies studied art at the ASL (Art Students League) of New York City. In 1910 he settled in Pasadena, California and established a studio. He also worked as a school administrator. His artistic specialty was religious paintings. 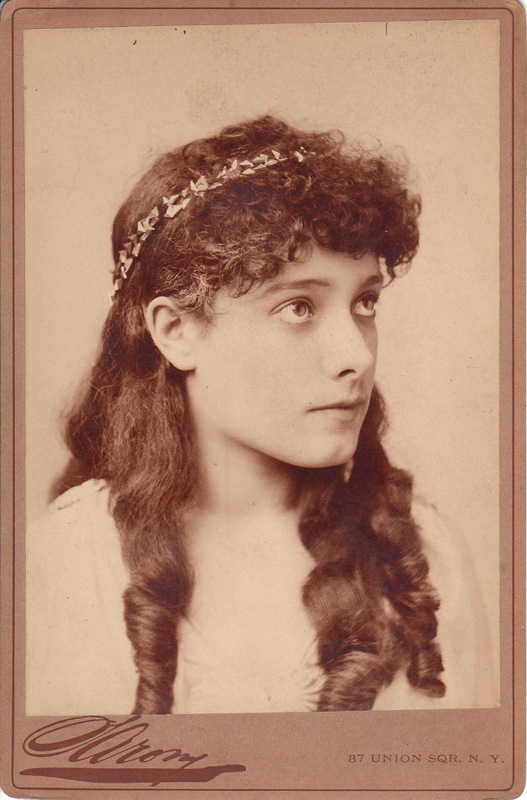 Isabel Irving (1871-1944) was an American actress born in Bridgeport, Connecticut. Her stage career began in 1886. She performed in many performances of Shakespeare. She was also in more than 30 Broadway plays between 1894 and 1936. These plays included “Merry Wives of Windsor” (1917) and “Uncle Vanya” (1930). The first cabinet photo was done at the studio of Napoleon Sarony in New York. Sarony was a very famous photographer of his time and known for his photos of theatrical performers and other celebrities. The second photograph comes from the studio of William McKenzie Morrison who was located in the Haymarket Theatre building in Chicago, Illinois. 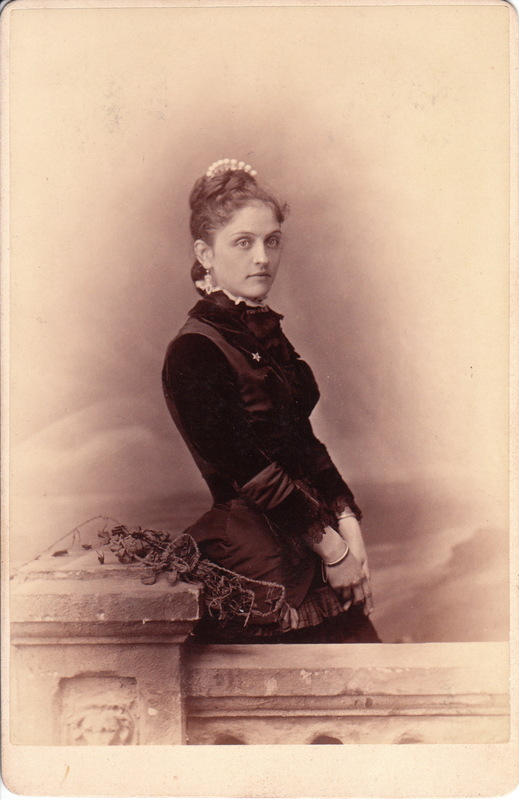 The third cabinet card portrait features Miss Irving photographed by celebrated New York photographer Benjamin Falk. 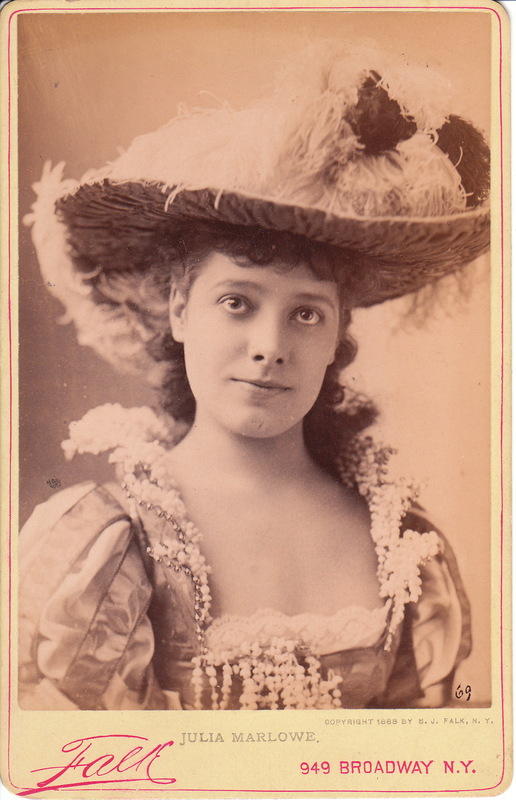 The fourth cabinet card was produced by Pach Brothers studio in New York City. 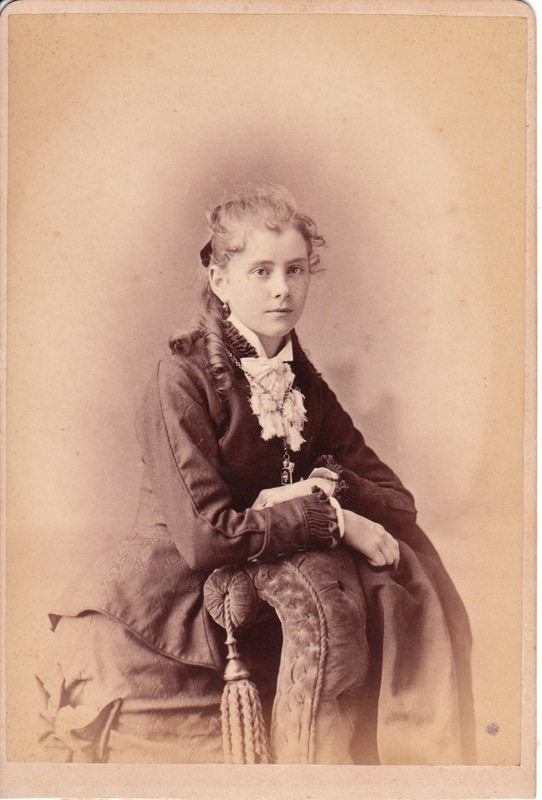 To view a photograph of Isabel Irving’s sister, write “Evangeline Irving” in the search box and press search. To view other photographs by any of the four cited photographers, click on the category “Photographer: Falk, Photographer: Sarony, Photographer: Morrison, or Photographer: Pach Brothers. Julia Marlowe (1865-1950) was born in England and as a young child moved to the United States with her family. In her early teens she began her theatrical career with a juvenile opera company. She began playing Shakespeare in her home town of Cincinnati, Ohio. She made her Broadway debut in 1895 and by the end of her career, had appeared in more than 70 Broadway productions. Her first husband was actor, Robert Tabor. Their marriage lasted six years. 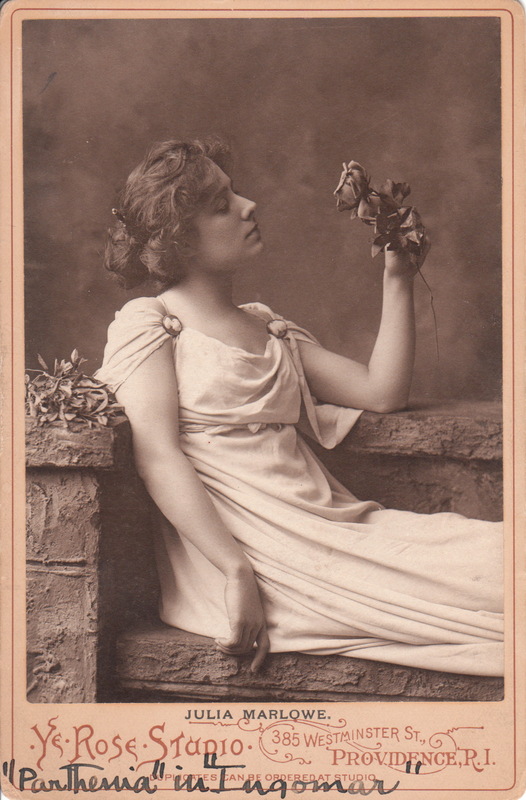 In 1904 she appeared in “When Knighthood was in Flower”. Great success in this play brought her financial independence. Earlier, in 1903, she appeared in ‘The Cavalier” and “Ingomar”. The New York Sun wrote about her performance in “Ingomar”; “There is not a woman player in America or in England that is – attractively considered- fit to unlace her shoe”. In 1904 she began a partnership with actor E. H. Sothern. They toured the United States performing various plays of Shakespeare. They were managed by Charles Frohman and later, the Shubert brothers. They were considered to be among the major Shakespearian actors of the day. 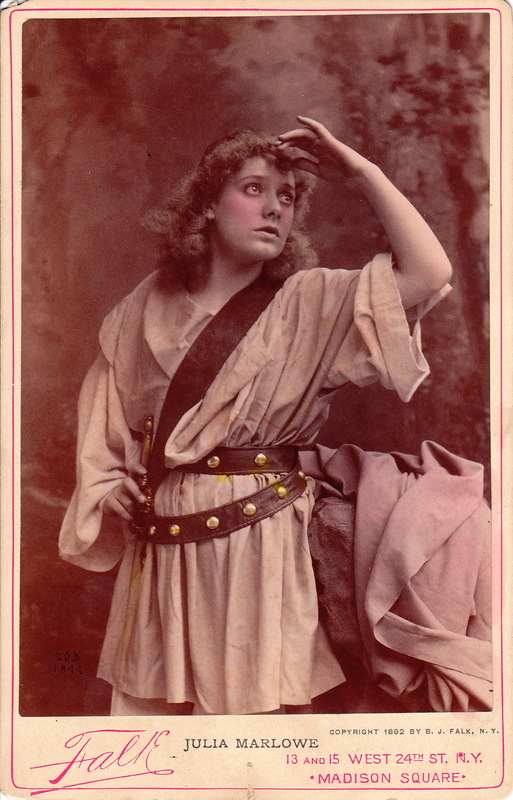 In 1906, Marlowe played in “Jeanne d’Arc” and also as Salome in “John the Baptist”. Later, Sothern and Marlowe played in London but were not terrific box office successes there. In 1911 Marlowe and Sothern married each other. In 1920 and 1921, they made eleven phonograph recordings for the Victor Company. The top Cabinet Card was produced by Newsboy as a premium for their tobacco products. The photographer was Falk and the image is from 1892. The second portrait of Julia Marlowe has a notation on the reverse of the card stating “Julia Marlowe Tabor”. Therefore, this photograph was likely taken during the time of her marriage to Tabor (1894-1900). The photographic studio that produced this portrait is Klein & Guttenstein of 164 Wisconsin Street, in Milwaukee, Wisconsin. Klein and Guttenstein were leading photographers of their time. Wilson’s Photographic Magazine (1902) reveals that the two men were very active in the Photographers Association of Wisconsin and other photography organizations. The photographers were considered part of a network of photographers skilled at producing publicity images of theatrical and vaudeville stars to be used in national magazines and other publications. The New York Public Library has a collection of portraits of actress Blanche Bates; produced by Klein & Guttenstein. The University of Pennsylvania Library has one of Klein & Guttenstein’s portraits of Julia Marlowe. The third portrait of Julia Marlowe in the cabinet card gallery collection is photographed by Sarony, the famed celebrity photographer located in New York City. 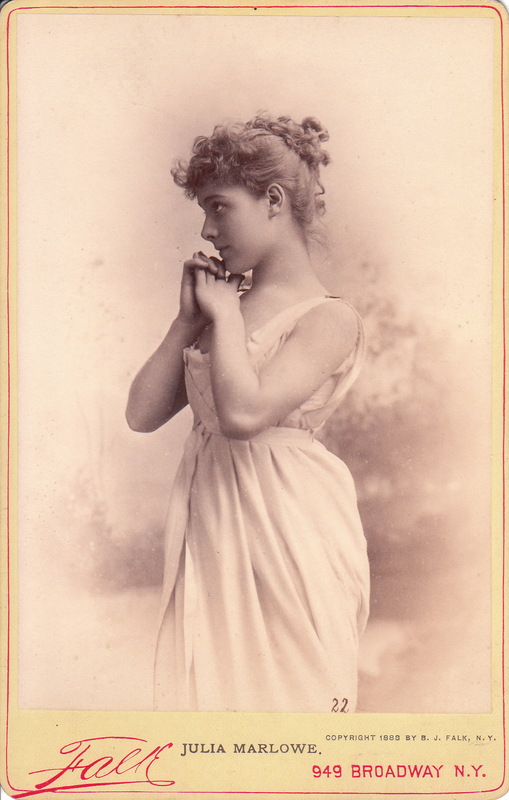 This cabinet card is signed by the actress and dated 1890. Additonal photographs by Sarony can be viewed by clicking on the category “Photographers: Sarony”. The fourth portrait of Miss Marlow features her in role in the production of “Countess Veleska”. The play was adapted for a German work, “The Tall Prussian”, by Rudolph Stratz. The play opened in New York in 1898 at the Knickerbocker Theatre. 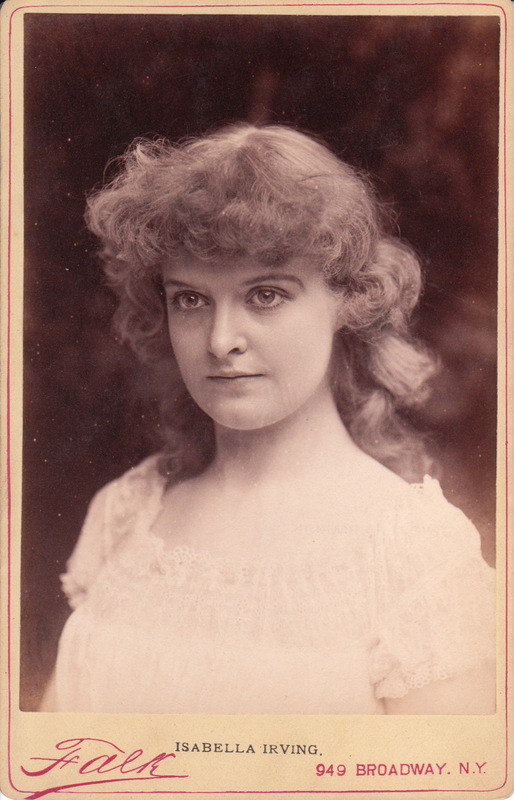 The review in the New York Times (1898) stated that the “drama was made wholly interesting by the personal charm and sincerity of Miss Marlowe”. In a sarcastic tone, the reviewer comments about Marlowe’s co star, Bassett Roe. The reviewer states that Roe has only two qualities of the man he was playing, “height and good looks”. The reviewer continues his scathing description of Roe; “The only time he actually warmed up was when he accidentally set his hair on fire. Even then he would have let it burn if Miss Marlowe had not gone to his rescue.” The photographic studio that produced the “Countess Veleska” cabinet card was Pach Brothers of New York City. Pach Brothers were photographers known for their photographs of celebrities of their era. To see additional photographs by the Pach Brothers, click on this site’s category of “Photographers: Pach Brothers”. 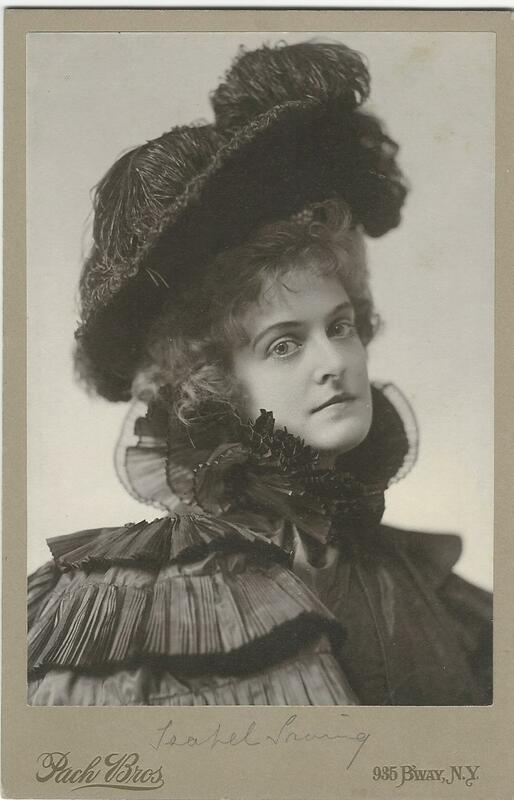 The fifth portrait of Julia Marlowe appears to be a photograph of the actress in costume for an unknown stage production. The image was photographed by Ye Rose Studio of Providence, Rhode Island. The reverse of the card indicated that the studio was opened in 1886. The studio was located in the Conrad building in downtown Providence. The building still exists. Other photographs by the Ye Rose Studio can be viewed by clicking on the category “Photographer: Ye Rose”. Portrait number six is an excellent example of the beauty of Julia Marlowe. 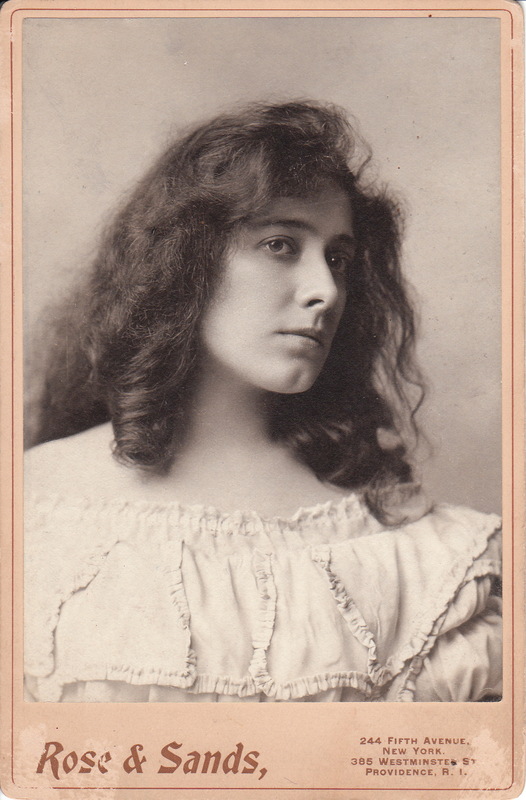 This image, from 1888, captures Ms. Marlowe at the young age of twenty-three. The photographer of this portrait was B. J. Falk, a celebrity photographer located in New York City, New York. To view other photographs by Falk, click on the category “Photographer: Falk”. The seventh portrait is another example of a B. J. Falk image. 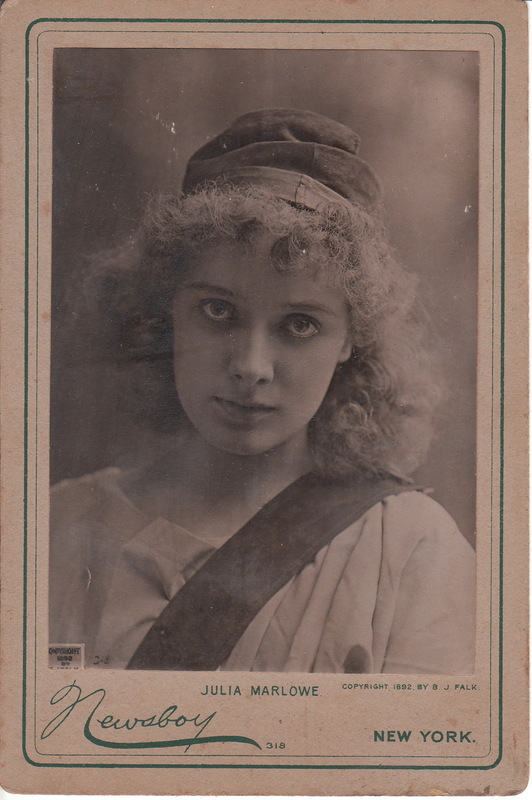 The photograph features a costumed Julia Marlowe in the production of “Cymbeline“. Cymbeline is a play by William Shakespeare that was based on legends about the early Celtic British King, Cunobelinus. The play deals with themes that include innocence and jealousy. Ms. Marlowe plays Imogen, the King’s daughter. Her expression in the photograph shows fear and concern as she looks at someone or something in the distance. Her left hand shades her eyes while her right hand clutches her belted dagger. A stamp on the reverse of this cabinet card reveals that it was formerly owned by Culver Pictures of New York City, New York. Culver Pictures has been collecting photographs and illustrations from the 19th and first half of the 20th century, since 1926. These pictures are used in books, films, and other forms of media. At the time that this cabinet card was stamped by the company, Culver Pictures was located in New York City. Portrait number eight is a close-up photograph of Miss Marlowe. The photographer of this cabinet card is the studio of Rose & Sands whose gallery was located in Providence, Rhode Island. Note that photograph number five also came from the Rose studio, but at that time, the gallery was called, the Ye Rose studio. The Wilson’s Photographic Magazine (1899) reports that Rose and Sands were the proprietors of Ye Rose. A humorous headline in a photography magazine stated “Providence Provides for All, And Rose Provides for Providence”. Print on the reverse of this cabinet card reveals that the Rose & Sands studio was opened in 1886 and that it specialized in “High Class Portraits from Cabinet to Life Size”. Also of interest, like photograph number seven, there is a stamp on the reverse of the photograph with the name “Culver Pictures Inc”. Photograph number nine features the beautiful Miss Marlowe displaying a mischievous smile. Note her engaging large eyes. 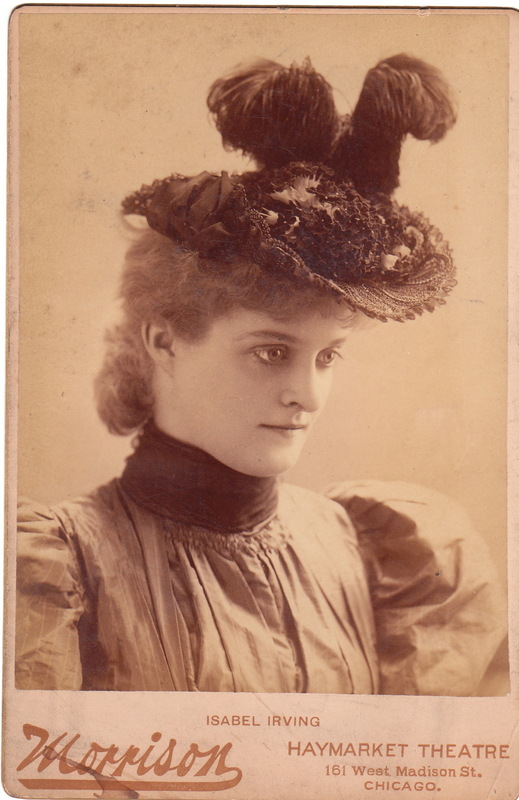 She is wearing a somewhat revealing dress (for the cabinet card era) and has a wonderful hat atop her head. This cabinet card photograph was published in 1888 by Benjamin Falk of New York City. The image is marked with the number sixty-nine. Portrait number ten is a closeup of Julia Marlowe with her head covered, but with her pretty face very visible. She is likely in costume for this photograph. The photograph is taken by B. J. Falk of New York City and has a copyright date of 1888. The cabinet card is marked number “86”. The eleventh photograph captures Miss Marlowe staring hypnotically at a flower. Someone, has written below her name that the image features her in the role of Parthenia in the production of “Ingomar”. The New York Times (1904) reviews the play and Miss Marlowe’s performance on opening night at the Empire Theater in New York City. The newspaper reports that Frederick Halm’s play was “impossibly romantic and deliciously sentimental piece of old-fashioned theatrics. Tyrone Power played Ingomar and he was described as “vigourous and picturesque” but the article added that his voice was “not at its best”. The review pointed out that Marlowe’s appearance in this play was to be her last appearance as an independent star before joining E. H. Sothern’s Shakespearean repertory. In regard to Marlowe’s acting in this play, it was written that she played a “dear little prig – adorably dear” (prig can be defined as smug or arrogant) and she presented “a masterpiece of harmonious, modulated, and sustained acting”. 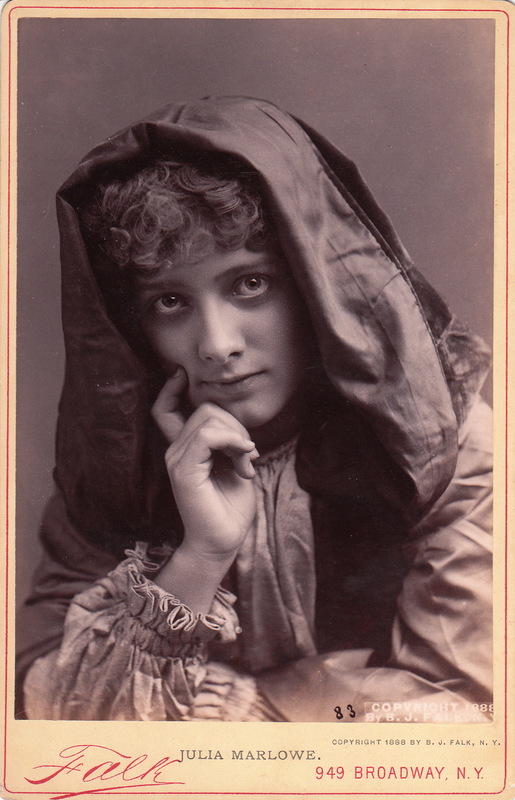 The 1904 performance of Julia Marlowe in “Ingomar” marked a return performance for this accomplished actress. The New York Times (1888) wrote a very positive review of the opening night performance in Washington D.C.. The appreciative audience included three Supreme Court Justices and a number of members of the Chinese Embassy. 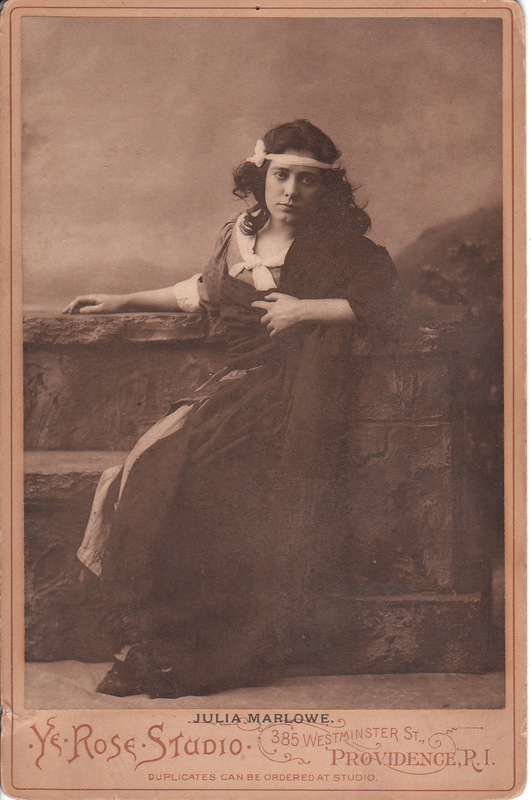 This cabinet card was produced by the previously mentioned Ye Rose Studio of Providence, Rhode Island and it likely dates back to her 1888 performance in the role. The twelfth cabinet card was produced by Benjamin Falk of New York City. 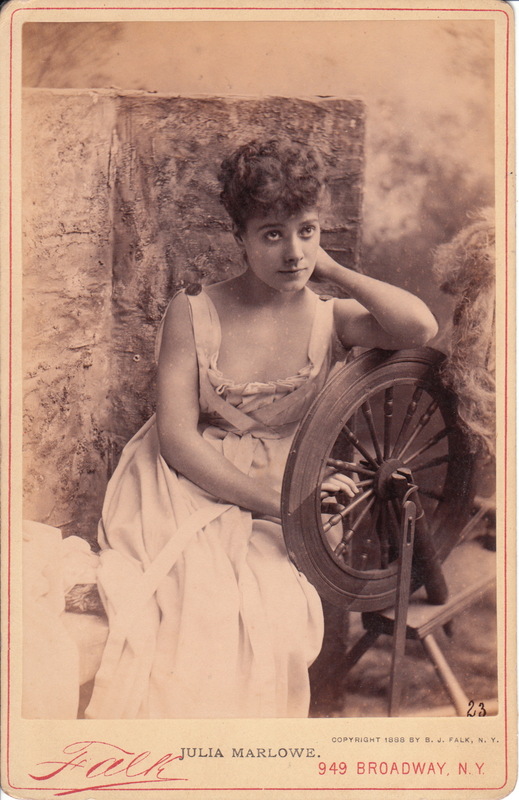 He posed Miss Marlowe next to a spinning wheel. 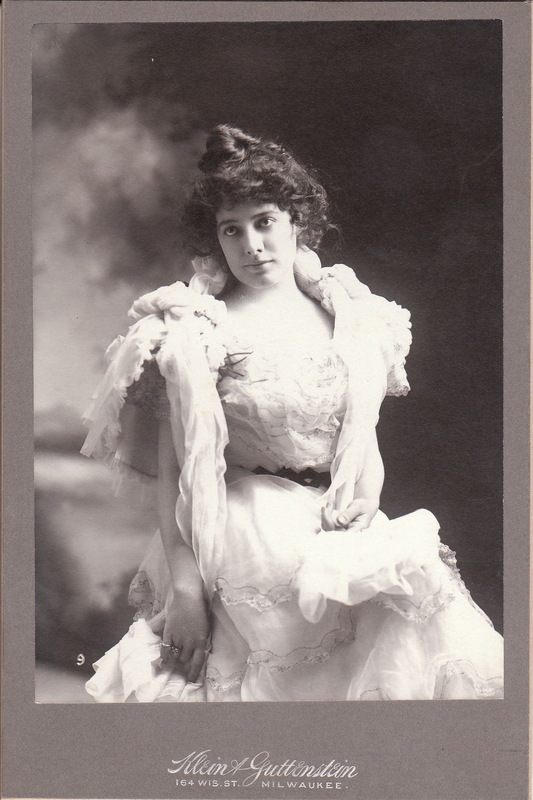 Her low cut dress makes this image a bit risque for the cabinet card era. If Falk or Miss Marlowe thought that looking up at the camera would create a “fetching appearance”, I would contend that their efforts failed. Rather than “fetching”, she appears dazed. The actress was a beautiful woman and provocativeness was not necessary to enhance her image. This photograph was produced in 1888 and was part of a series (#23). Cabinet Card number thirteen is part of a series that includes Cabinet Card number ten. Both cards were photographed by B. J. Falk and have a copyright date of 1888. Both portraits are close-ups but this one is captures Marlowe looking at the camera while number ten offers a profile view. Falk really captured the actresses eyes. Her eyes are beautiful and they are haunting at the same time. This photograph is marked number number 83 of the series. 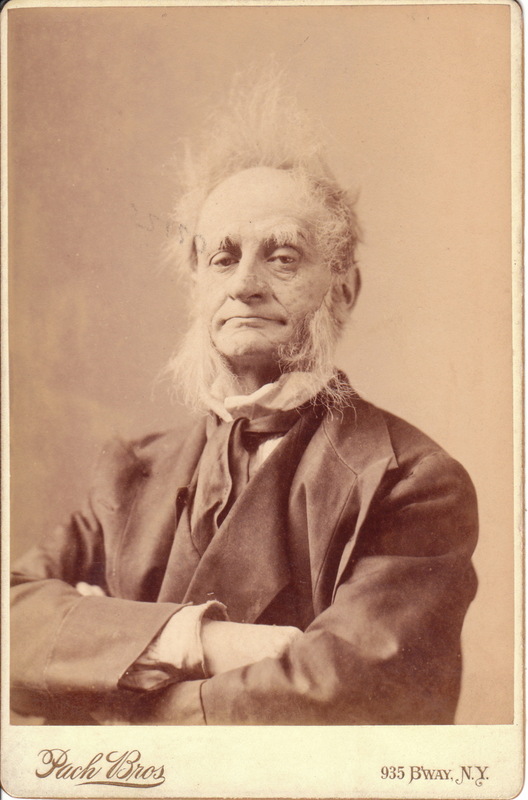 This unusual looking gentleman is an English actor and theatre manager named John Hare. John Hare (1844-1921) was born in a town called “Giggleswick”. This is an appropriate name for the birthplace for a man who began his acting career in comic roles. Giggleswick was located in Yorkshire, England. Hare began his acting career in Liverpool in 1864. He is often associated with the plays of T. W. Robertson. Hare managed the Court Theatre (1875-1879), the St. James Theatre (1879-1888), and the Garrick Theatre (1889-1895). His greatest success as an actor was in the play A Pair of Spectacles (1890). This portrait of John Hare likely captures the actor in wardrobe and makeup for one of his productions. However, it is possible that he aged poorly which can be hypothesized because photographs taken of the actor in earlier years show a man with a significantly more pleasing appearance. The teenage girl featured in this cabinet card photograph appears to be deep in thought. She looks quite delicate. The contemplative teenager is well dressed and very poised. The photographer, G. W. Pach, has done an excellent job of posing his subject and produced an admirable artistic photograph. Pach, whose studio was located at 841 Broadway in New York City, is a celebrated photographer of his time. This cabinet card is likely from the earlier part of the cabinet card era. To learn more about the photographer and to view more of his images by, click on the category “Photographer: Pach Brothers”. 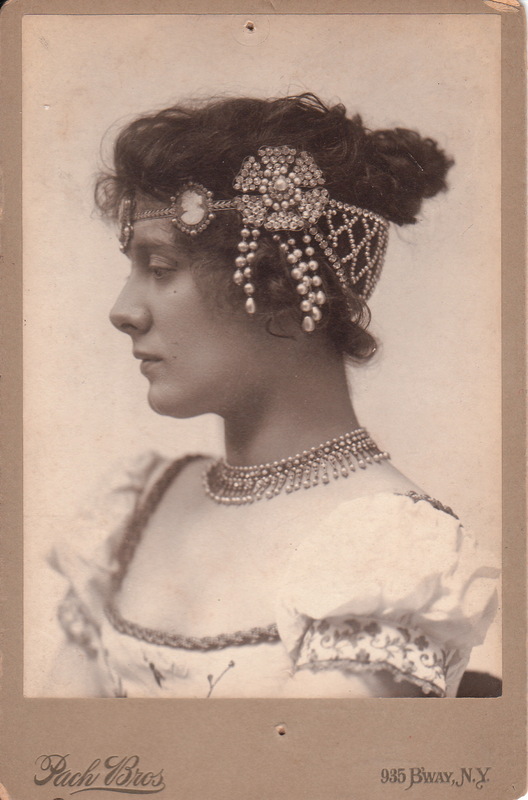 This cabinet card portrait of a pretty and fashionable young woman is the work of G. W. Pach. The woman in the photograph appears quite austere but of course sometimes appearance can be deceptive. Pach, and the Pach Brothers, were celebrated photographers of their era. G. W. Pach’s studio at the time of this photograph was located at 841 Broadway at the corner of 13th Street in New York City. Pach also had branch studios at Harvard and Yale Universities as well as in Poughkeepsie and West Point, New York. In addition, there were branch studios in Long Branch and Ocean Grove, New Jersey. The aforementioned studios are all mentioned in print on the reverse of the cabinet card. Also on the back of the image is a pencilled date indicating that this photograph was taken in 1879. To learn more about the Pach Brothers and to view additional photographs taken by them , click on the category “Photographer: Pach Bros”. This Cabinet Card is a photograph of actress Odette Tyler (1869-1936) and it is photographed by famed celebrity photographic studio, the Pach Brothers. Tyler appeared in many productions including “The Love Route” (1906) which appeared on Broadway. She was an American actress and comedienne. She worked for Charles Frohman and was a member of a number of theater companies including the Madison Square Company (1884-1885). She authored a book, “Boss: A Story of Virginia Life”. Tyler was born Elizabeth Kirkland in Savannah, Georgia. Tyler’s father was a West Point graduate and served as a Confederate General during the Civil War (General William Kirkland). 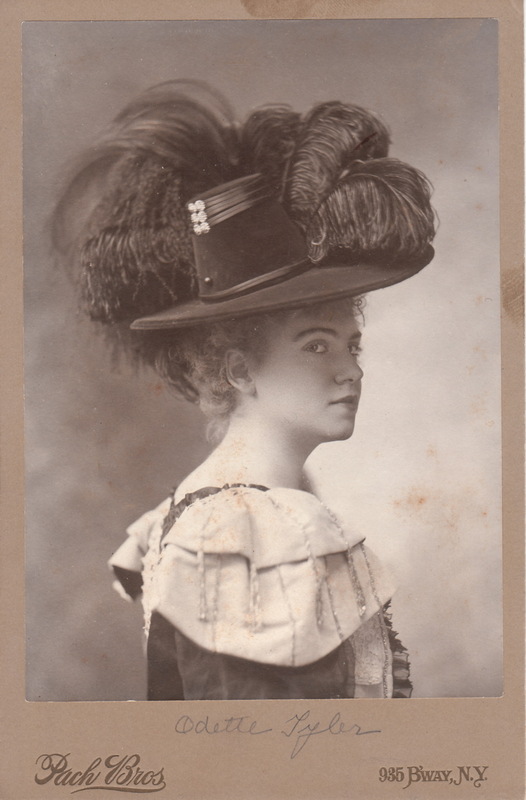 Odette Tyler is quite pretty in this image and her feathered hat can be described as elaborate. To view other photographs by this studio, click on the category “Photogapher: Pach Bros.”. This adorable little girl poses for her portrait at the studio of Pach Brothers in Cambridge, Massachusetts. Pach Brothers was a famous New York City photographic studio located on Broadway and many celebrities had their photographs made at that location. The founder of the studio was Gustavus Pach who died in 1904. His two brothers who were his partners were Oscar (predeceased Gustavus) and Gotthelf. The studio was so successful that it opened branches in Massachusetts, Connecticut, New Jersey and Pennsylvania. To view other photographs by this studio, click on the category “Photographer: Pach Bros”. This Cabinet card is a great image of a rugby player in uniform and holding the rugby ball. He looks able and ready to walk on to the pitch and join the scrum. The photographic studio is the famed Pach Bros of New York City. To view other photographs by this studio, click on the category “Photographer: Pach Bros.”.